Portrayed by Anya is a luxury family photography experience by classical photographer Anya Baguina. Devoted to the art of classical black and white film photography, Anya creates exquisite prints and luxurious albums that embody your family’s legacy. In every image, you can see her profound belief that intimate family moments are to be captured, preserved, and treasured for years to come. Time flies. Anya believes that the simple moments of a family day together are the most precious; that our homes are an integral part of family history, the setting for our most sacred memories. With every commission, Anya composes a unique family story in classical photographs. 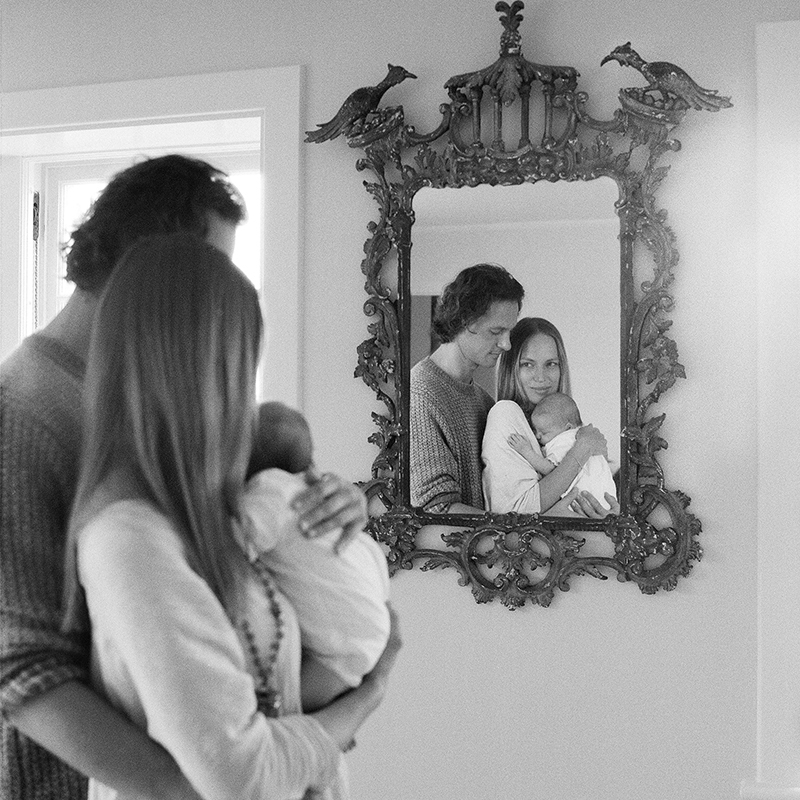 Anya captured a very special moment for us as a new family with grace and ease. She worked with a wonderful camera (which baby Leo was enchanted by!) and composed shots that were exceptionally elegant and refined. With her easy presence and gentle way of working the time we spent together was a complete pleasure and the results were beautiful. Having images shot on film has a quality that can’t be compared to any of our digital photos and we will treasure the images for years to come. Thank you Anya! We are so grateful. Before meeting Anya we’ve been looking for the right photographer to take the first images of our daughter for a while. We wanted the images to be unique and powerful. When we got introduced to Anya and she told us about her love for old cameras and film photography, we knew she was the right fit. She skillfully uses her knowledge of film photography and her creativity to set up the scene for an unforgettable image. She is discreet, professional and manages to witness and capture the intimacy of a family without intruding or disrupting it. I fully trust Anya and couldn’t recommend her as your family photographer more! 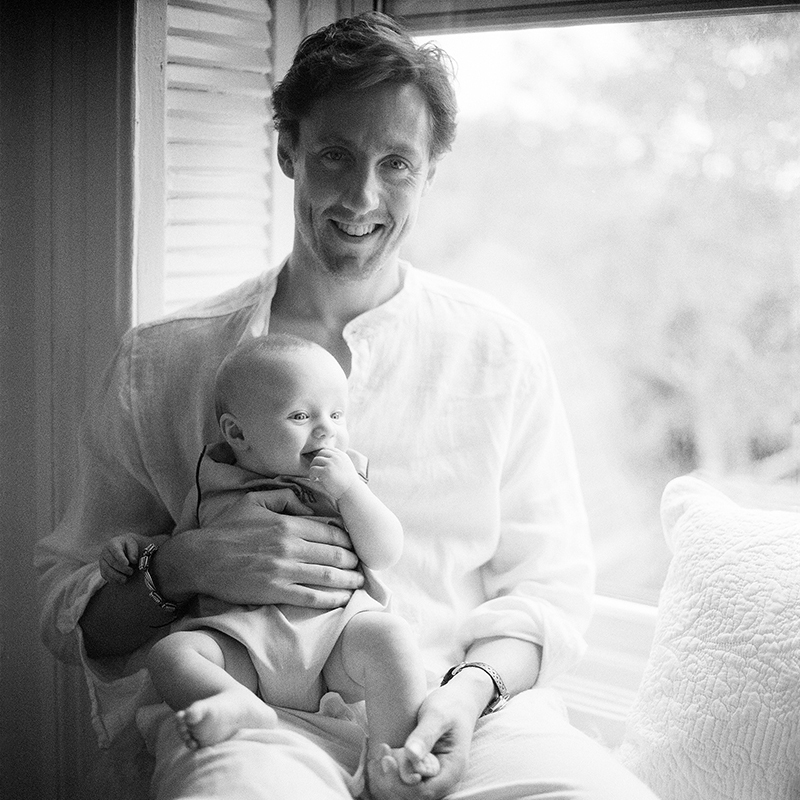 Anya photographed Erik and I one week before our baby boy was born and then again when he was 10 days old. Having these pictures of him in my tummy and then in my arms in the first few days of his life is so special. Anna is a natural and poignant photographer, she made me feel completely at ease. She has tenderness, and truly loves her work - taking a huge amount of time and care to set up a shot and finding the best composition. I really trusted her intuition and am so happy with the final photos, I couldn’t recommend her highly enough. 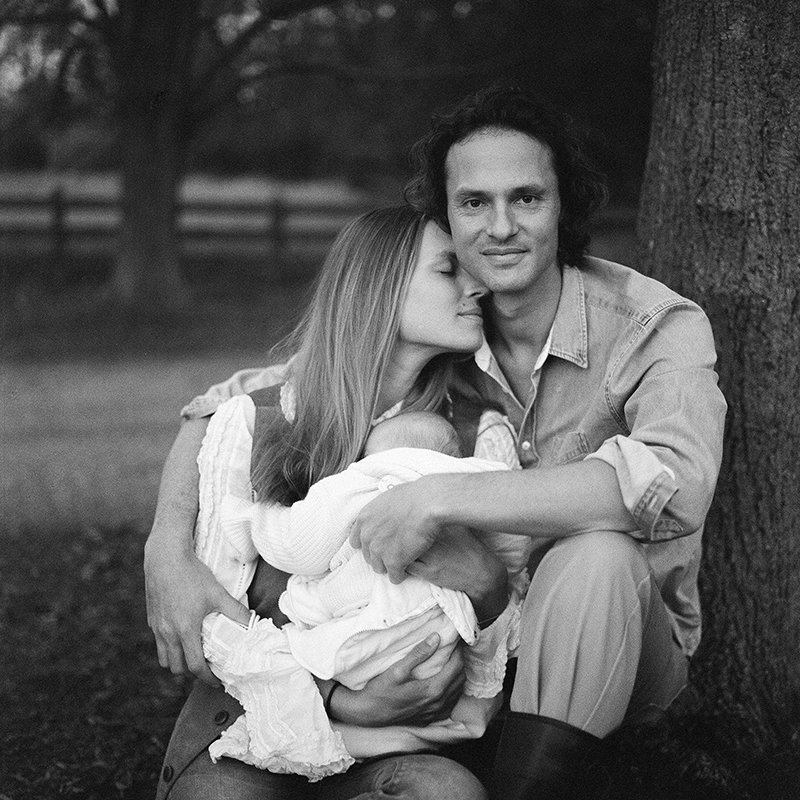 Thank you Anya for capturing our family so beautifully and taking such care of our baby and my body in your photographs. Anya strives for the highest standards in her artistic work, only using film, rather than digital images. We are confident that this traditional medium better captures the light, mood, and atmosphere of an intimate scene and the people at its heart. Les objets d’art in their own right, all of Anya’s commissions are beautifully presented in handcrafted albums and frames. We bring together experts in traditional craftsmanship from all over the world for every step of the process, ensuring that our clients receive exceptional images they can hold. Anya is accustomed to working with high profile families, and privacy and confidentiality are integral values that define her work. The intimate family moments we capture are kept private, and only shared with permission from the client. All of the photographs shared on the website and album samples are used solely with permission from the families that commissioned the session. Q: Where are you based and are you available for travel? A: We are based in London, UK and often found traveling to photograph commissions for families in countries across the continents. Q: Where does the shoot normally take place? A: We believe a shoot should take place in a meaningful location for the family. Most often it is a family home, holiday house, or the location for traditional family activities. Sometimes we may choose a favorite park or spot in the city or a countryside location. Anya enjoys shooting inside and outside, as both the house and the city you spend your time in are integral parts of your family story. Q: What can we expect from our family album? A: Anya’s handcrafted albums are luxurious objects, presenting your family’s story with tactile elegance. Each image is printed on highest quality photographic paper and flash mounted to the album page. Please note that Anya’s images are never printed with inkjet methods. The high-quality process for printing each image requires time, and immense expertise goes into hand binding the album pages. Creating these albums is not a quick process, it is a luxurious and time-tested craft. Q: How much shooting time is reserved for a session? A: We never limit the hours of your shoot. It is important to get the best photographs and go with a natural pace that our clients are comfortable with. When it comes to newborns and toddlers, we adjust to the baby’s needs and schedule. Expectations and a plan for the shooting time will be discussed with clients beforehand; however we keep the whole day free for your shoot. Multiple day shooting is available by request. Q: What is included in the commission cost besides the shooting time? A: The price for each commission includes shooting time, development of the films, artistic editing, and printed photo proofs. Anya’s signature handbound album is also included, giving you a luxurious way to present your family photos. Additional framed prints are available upon request. Travel cost, shipping, taxes, and custom duties are not included in the price of the commission. A: Anya creates family stories, which means photographing the people that make up your family, whatever their age. Sometimes pets join the shoot, too! We have worked with new mothers and their newborns, toddlers, teenagers, and grandparents. Q: How long does it take from the shooting day until the family album is in our hands? A: Artistry takes time, and film photography involves a great deal of manual work. To see the photo proofs, please allow 6-8 weeks from the day of your shoot. During this time, the film will be developed and artistic editing will be completed, and photo proofs will be printed and delivered to you. Please allow 6-8 weeks for your bespoke album to be crafted and prints to be produced after you have selected your favorite images. Q: What are the guiding prices for the commissions you shoot? A: The prices for a shoot are determined individually. Commissions begin at £5000. Number of locations and family size directly affect the amount of materials, chemicals, and time needed to hand-process your films. Schedule a consultation with Anya to discussion your session.